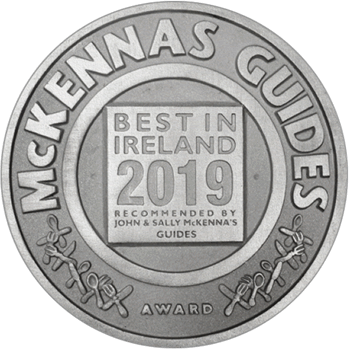 Since 1992, when the very first edition appeared, John and Sally McKenna’s 100 Best Restaurants in Ireland has celebrated, championed and offered critical analysis of the best restaurants throughout Ireland, North and South. The McKenna’s 100 Best Restaurants is iconoclastic – it includes food carts, beachside shacks, and tiny rooms, as well as grand theatres for eating – and the list has consistently interpreted and defined what modern, creative Irish cooking is, and what it can achieve. After 25 years, the 100 Best Restaurants list is as definitive and controversial as ever, and each year the new list excites enormous controversy and comment. 48 McCurtain Street, Cork, Co.Cork. Spanish Arch, Long Walk, Galway. 1 Brewery Place, Bridge Street, Westport, County Mayo.